An Indian man from thesouthern state of Karnataka has a weird diet. He was found to be addicted to eating bricks, gravel and mud. 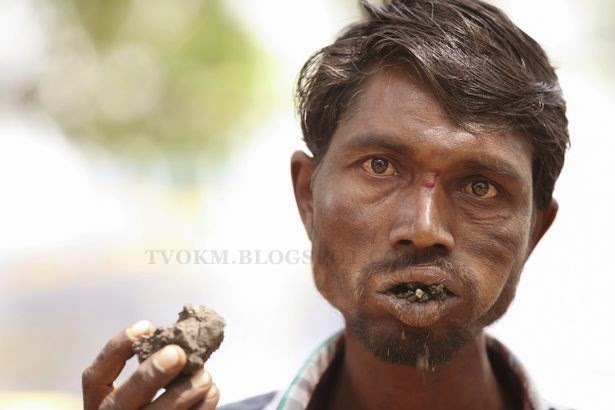 Miraculously, the man, Pakkirappa Hunagundi, age30, can eat up to three kilograms of rock and mud from roads on a daily basis. Hunagundi began to have an appetite for objects that cannot be eaten by others when he had just turned 10 years old. Since then, he has started chewing rocks and mud that can be found on the walls and streets. He claims that this diet does not cause pain for him. This strange eating disorder is known as Pica, a kind of addiction to substances that have no nutritional value. Surprisingly, his teeth are still good and Hunagundi ignoring advice from anyone, even from his family that he should stop the addiction. He has been eating bricks and gravel for about 20 years. He likes to eat them and have them be a part of his life. This is necessary for him. He can avoid eating dishes (regular meals), but not stone or mud. His mother tried to persuade him to leave strange diet, but for people such as he, building materials have a better taste than regular food.